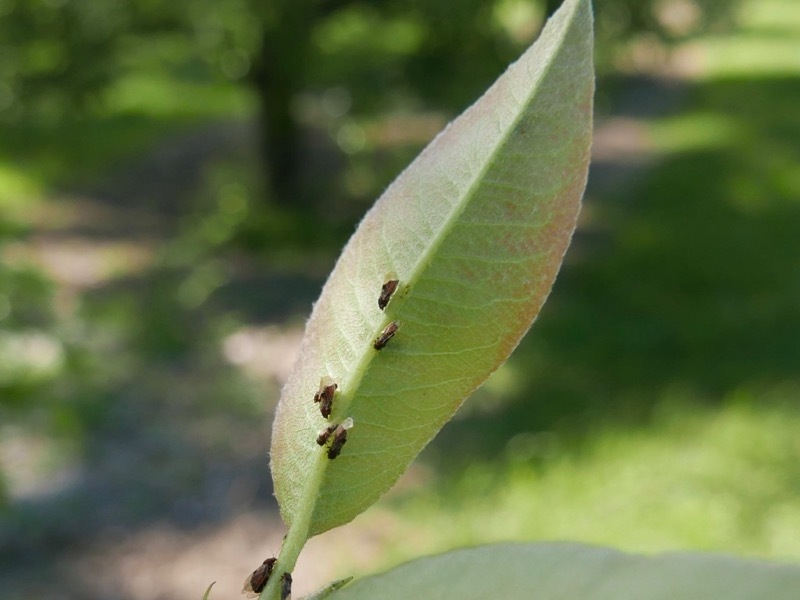 From UC Statwide IPM Project : Webspinning mites produce a characteristic blackening of pear leaves when they feed. 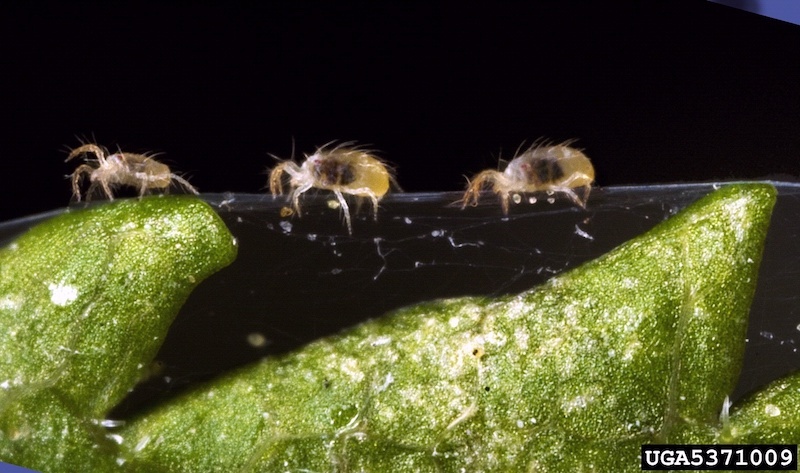 Pear trees can tolerate fewer webspinning mites than European red mites. 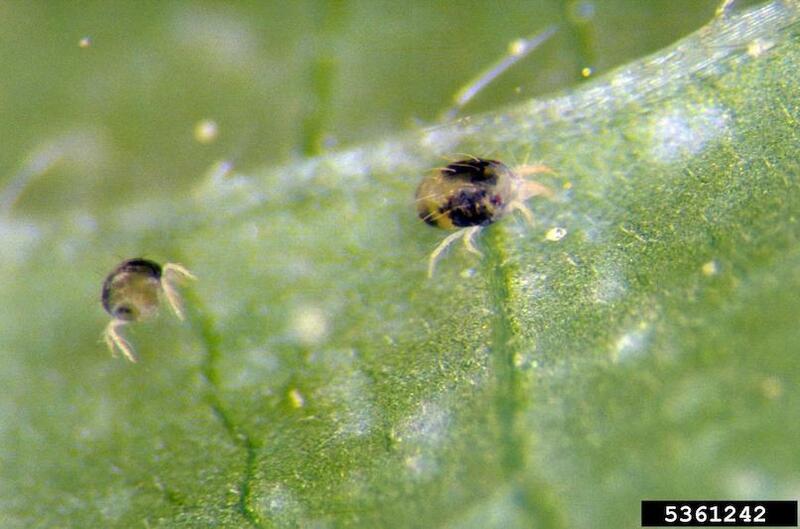 Usually two to three mites feeding near the midrib of a leaf produce black areas from the midrib to the margin. This blackening may appear even after mites have been controlled, especially if a period of hot weather follows the spray application. 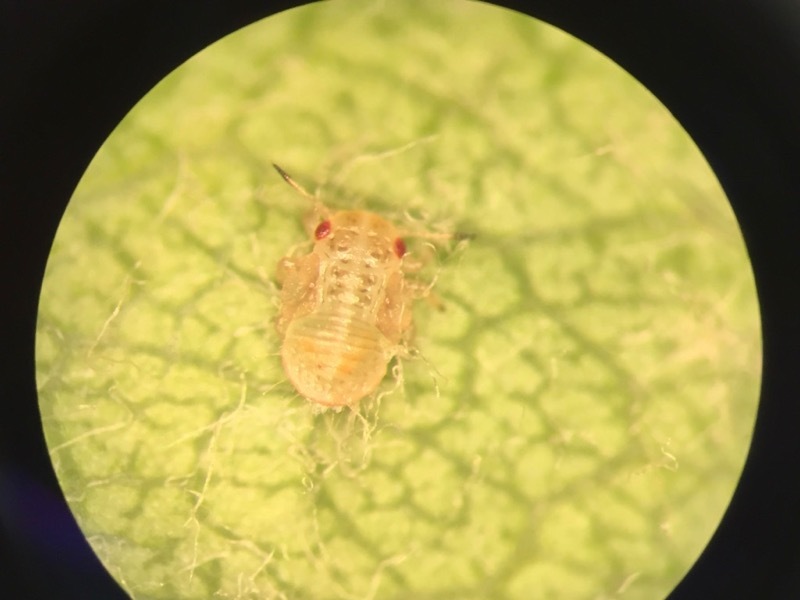 High mite populations may cause defoliation. Severe defoliation can stunt fruit and may cause the trees to bloom in fall, thus reducing next year's crop. However, if defoliation is limited to water sprouts in the top or interior of the tree, it will not adversely affect the crop or tree. Blossom blast of pear is a bacterial disease caused by Pseudomonas syringae. Pseudomonas syringae is favored by cool, wet weather and is distributed by splashing rain and insects. The severity of blossom blast can be decreased by a combination of a delayed-dormant copper spray plus two streptomycin sprays applied during bloom, however, it must be applied pre-symptom. 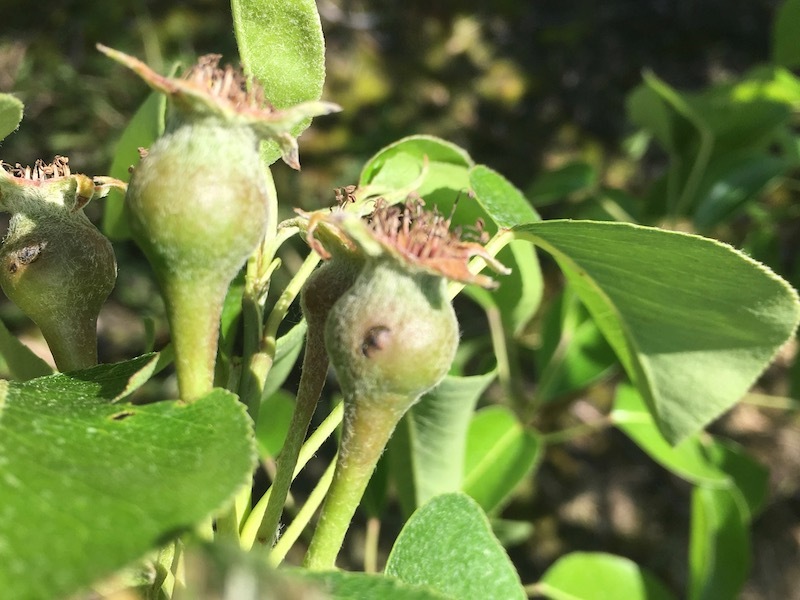 Symptoms of blossom blast include blackening of the calyx end of individual fruitlets, entire blossom clusters with cluster leaves remaining unaffected, or complete death of clusters including both the blossoms and the leavees. Severe outbreaks of blossom blast on pears are usually associated with spring frosts because frost injury provides entry sites for infection. The severity of blossom blast can be decreased by a combination of a delayed-dormant copper spray plus two streptomycin sprays applied during bloom, however, it must be applied pre-symptom. From: Rosenberger, D.A. 1996. Pear blossom blast. Scaffolds Fruit Journal (June 3); 4. Blossom Blast . Blossom blast is a bacterial disease caused by Pseudomonas syringae. Pseudomonas syringae is favored by cool, wet weather (as compared with fire blight bacteria, which are favored by warm, wet weather). Pseudomonas syringae survives and grows on the surface of many different plant species and is distributed by splashing rain and by insects. Severe outbreaks of blossom blast on pears are usually associated with spring frosts because frost injury provides entry sites for infection. 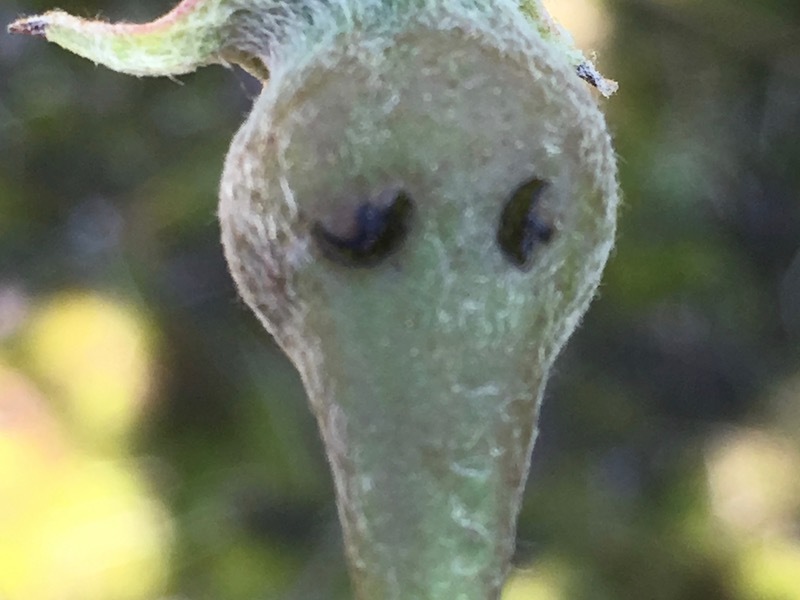 In the Columbia County (NY) orchards I observed, many of the developing fruitlets had frost rings, indicating that fruit were damaged by a frost (probably on May 14). However, less than 5% of the flower clusters were affected by blast. 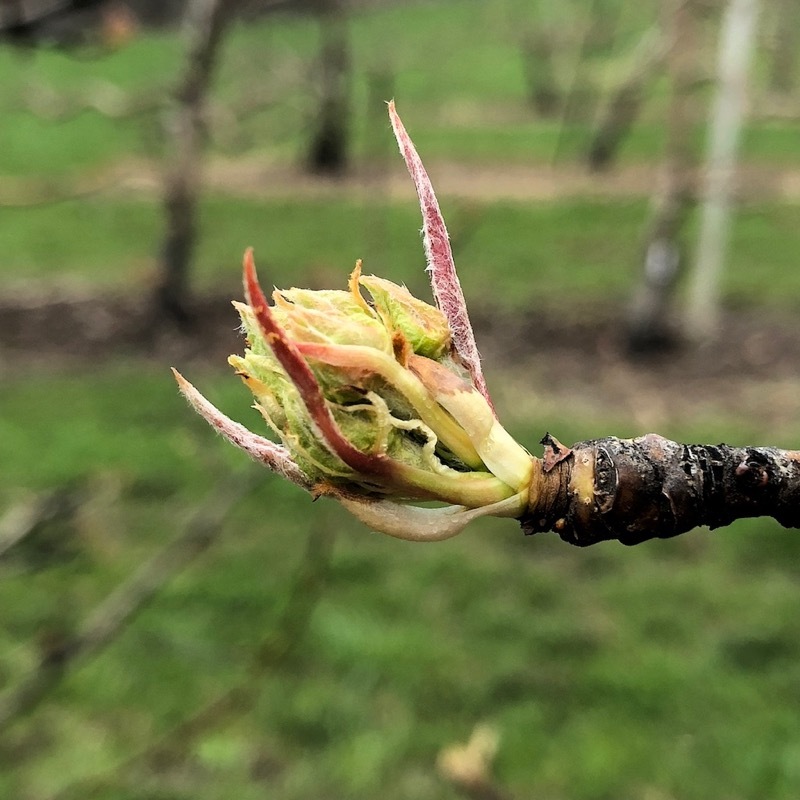 Symptoms of blossom blast include blackening of the calyx end of individual fruitlets, blackening of entire blossom clusters with cluster leaves remaining unaffected, or complete death of clusters including both the blossoms and the leaves. Young leaves near affected clusters may have small nondescript necrotic leaf spots. 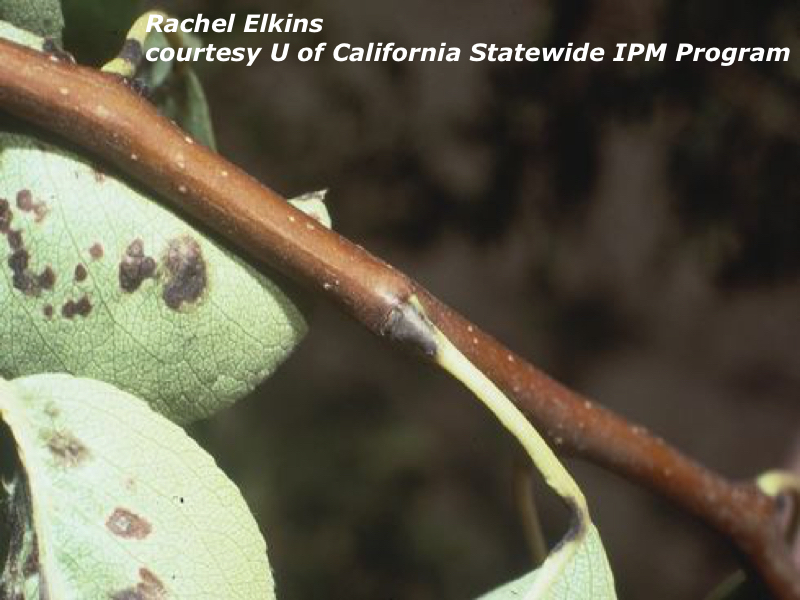 Unlike fire blight, blossom blast does not spread into larger limbs or cause extensive damage to pear trees. However, heavy infections can seriously reduce fruit set. In its early stages, when clusters of blossoms are just beginning to turn black, blossom blast can easily be confused with fire blight. However, symptoms of blossom blast are likely to appear earlier in the season than would be expected for fire blighted blossoms. (The expected appearance of blossom blight symptoms associated with fire blight can be determined using the MaryBlyt program.) 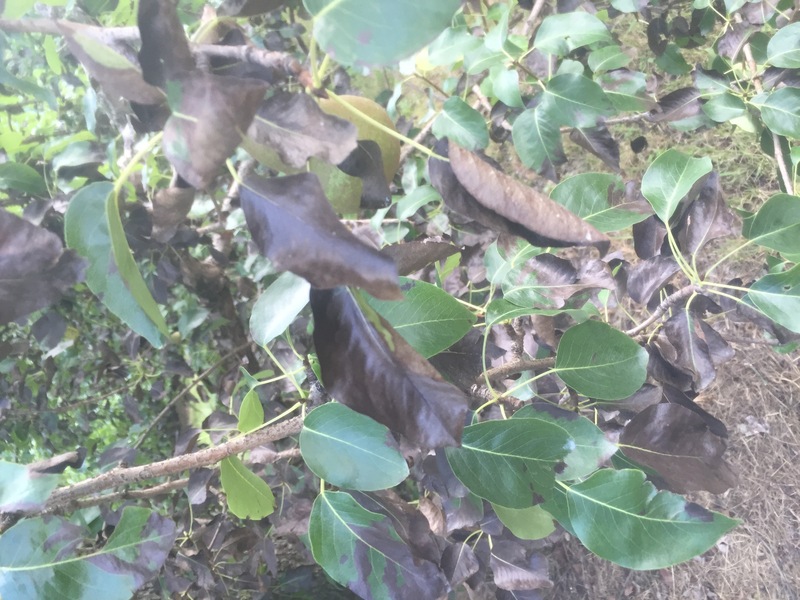 Fire blight bacteria produce a toxin that is rapidly transported to adjacent leaves and causes blackening of leaf veins, whereas perfectly healthy leaves are often found just below clusters of flowers killed by blossom blast. Clusters affected by fire blight frequently have drops of bacteria ooze on their surface, sometimes visible only with a hand lens, whereas ooze is not visible with blossom blast. 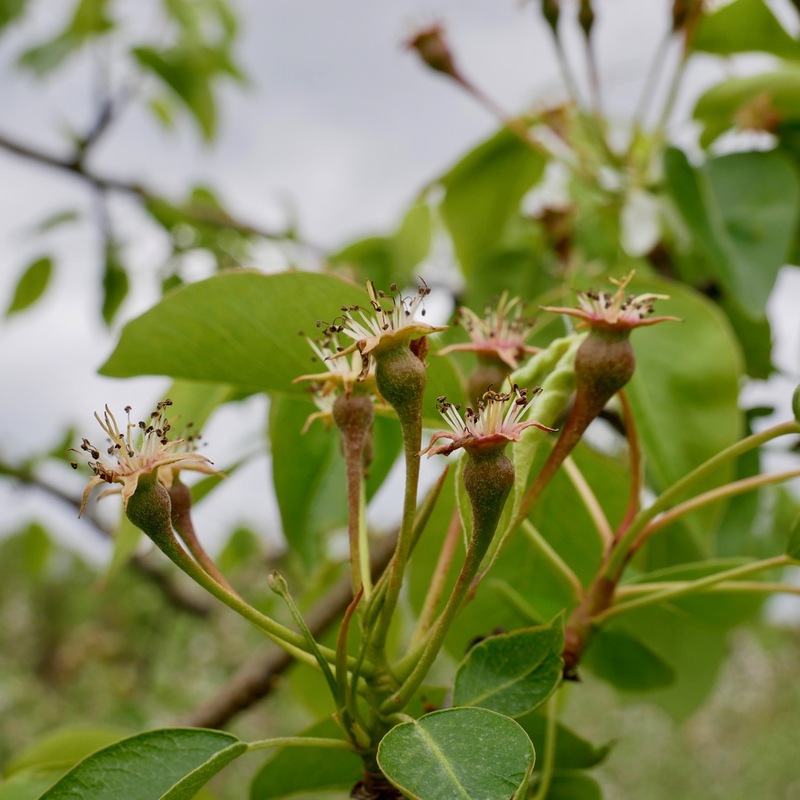 Although no fruit grower is ever happy about having diseases in their trees, most pear growers are happy when someone diagnoses dead flower clusters as resulting from blossom blast rather than from fire blight. Nothing can be done to change the course of the disease after symptoms of blossom blast appear, and no further spread of the disease will occur after bloom. When anticipated in advance, the severity of blossom blast can be decreased by a combination of a delayed-dormant copper spray plus two streptomycin sprays applied during bloom (See Plant Dis. Reptr. 61:311-312  and The GoodFruit Grower, 1 July 1986, pages 22-23). Unfortunately, streptomycin sprays timed to control fire blight infection periods will usually be applied too late during the bloom period to provide complete control of blossom blast. 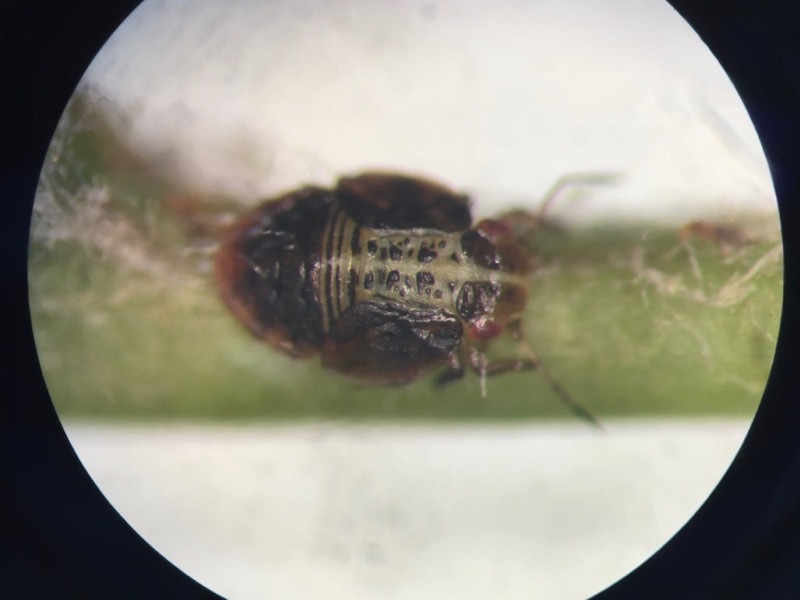 One of the Columbia County orchards affected this year (1996) had been protected with copper plus two streptomycin sprays timed for fire blight. Fabraea leaf spot is a fungus (Diplocarpon mespili) that infects primarily leaves and fruit of pear and quince. Infections can result in significant leaf spotting, defoliation, and unmarketable fruit. 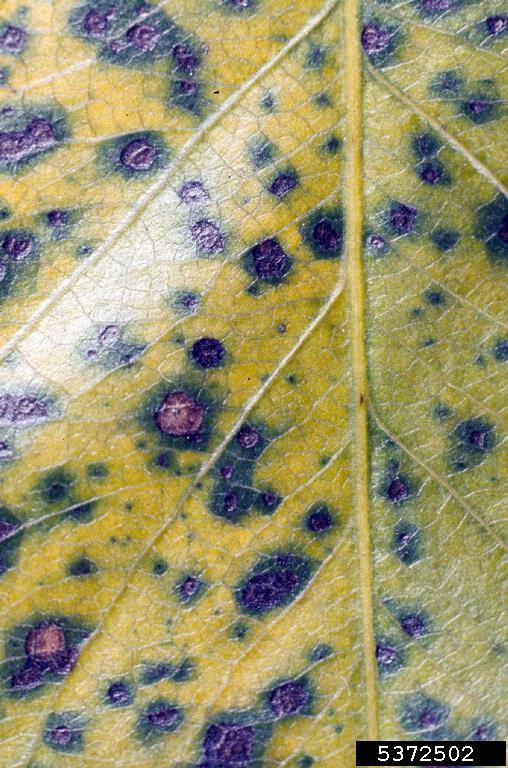 Fabraea leaf spot infection occurs from spring to summer, and like apple scab, spores are released and spread during periods of rainfall. Sanitation by flail mowing leaves and brush may help reduce Fabraea leaf spot spores, however, chemical control is still usually necessary. 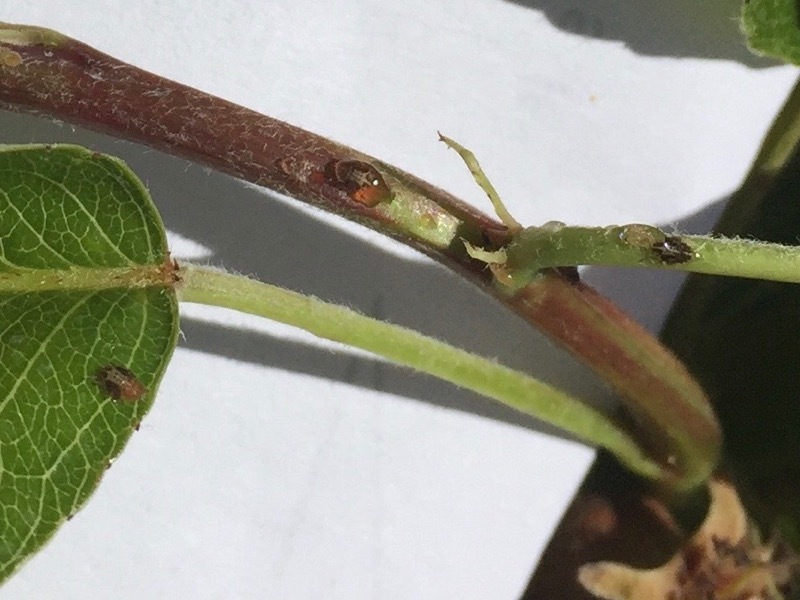 Chemical control using contact fungicides beginning in the spring and continuing into the summer in wet years are necessary to control Fabraea leaf spot. Fabraea most noticeably first manifests itself as small, purple-black spots on leaves and fruit. Spots gradually enlarge into brown lesions 1/8 to ¼ inch in diameter. When the infection is severe, defoliation can occur and fruit will become deformed and not sellable and/or drop off the tree. 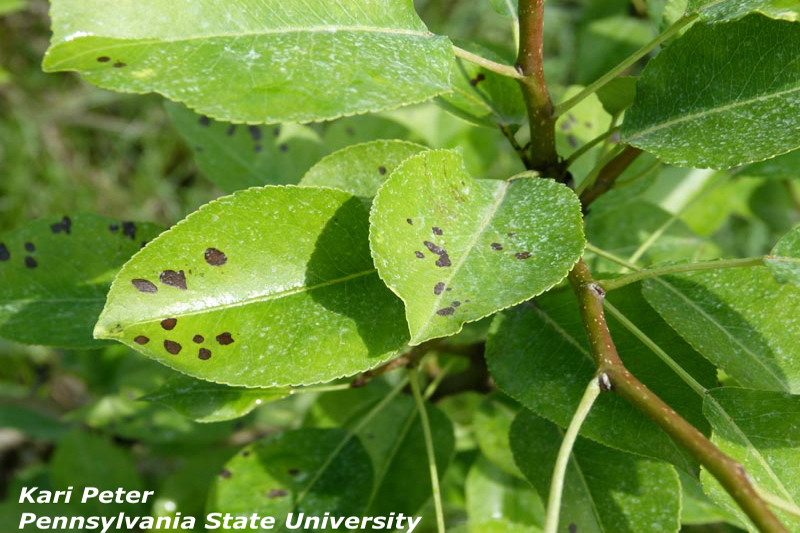 Fabraea may also infect shoots, again appearing initially as purplish spots, becoming lesions/cankers which may persist into the next growing season. Leaf and fruit infections are most notable in the Northeast and Midwest, but in the Southeast , shoot infection can be significant. Severe infections can result in reduced flower bud formation for the following season. Similar to apple scab, much Fabraea overwinters in leaves on the orchard floor. Farther south, overwintering is also likely to occur in shoot cankers. 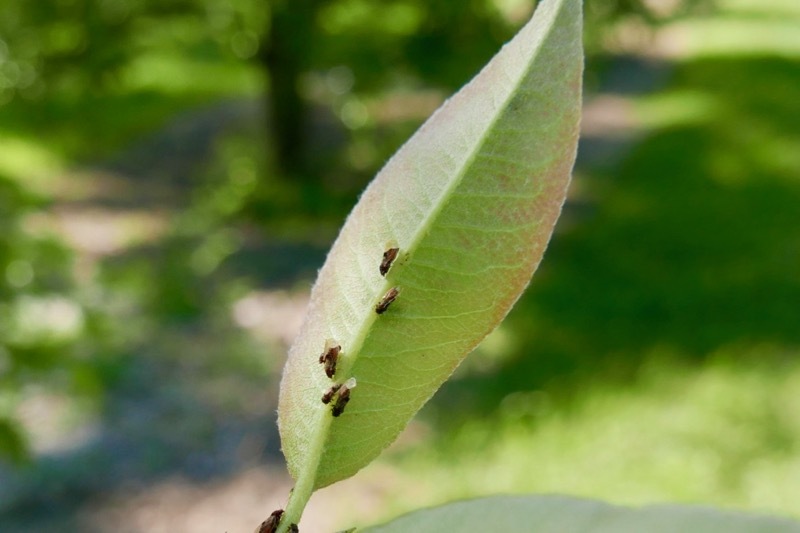 Spores are released from leaves with rain from mid-May to July (in the Northeast and Midwest) and result in primary infection on fruit and foliage. Shoot cankers spread Fabraea from late-April through May (in the Southeast) with more driving rains. Length of wetting for infection to occur can range from 12 hours at 50 degrees F. to as little as 8 hours from 68 to 77 degrees F. Infections take about 7 days to become visible. Once primary infection occurs, secondary infection can spread rapidly with rain and wind during the summer, particularly during wet seasons. Contact/protectant fungicides are necessary to control Fabraea leaf spot. EBDC fungicides (Manzate, Penncozeb, Dithane) and Ziram give good control. (But EBDC’s have a 77 day Pre-Harvest Interval.) 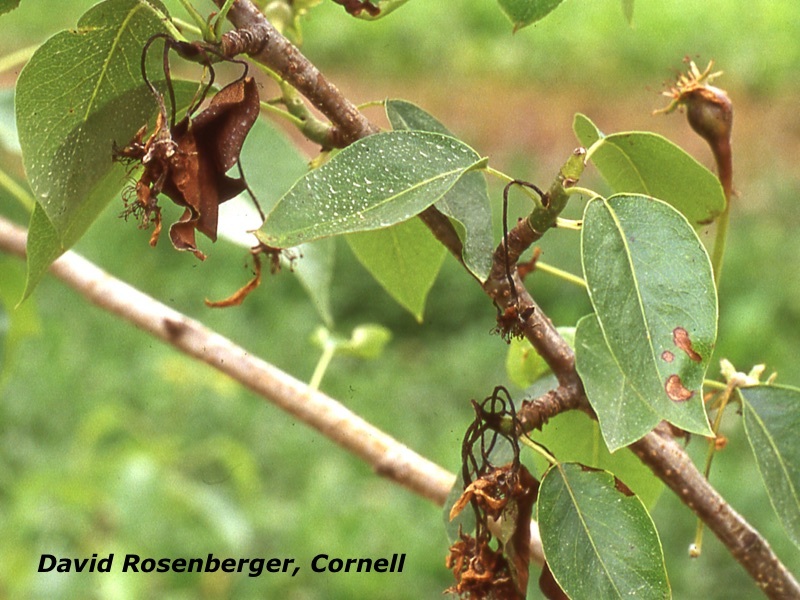 Early season fungicide application(s) for pear scab (as long as EBDC’s or Ziram are included) will prevent initial infection by Fabraea. 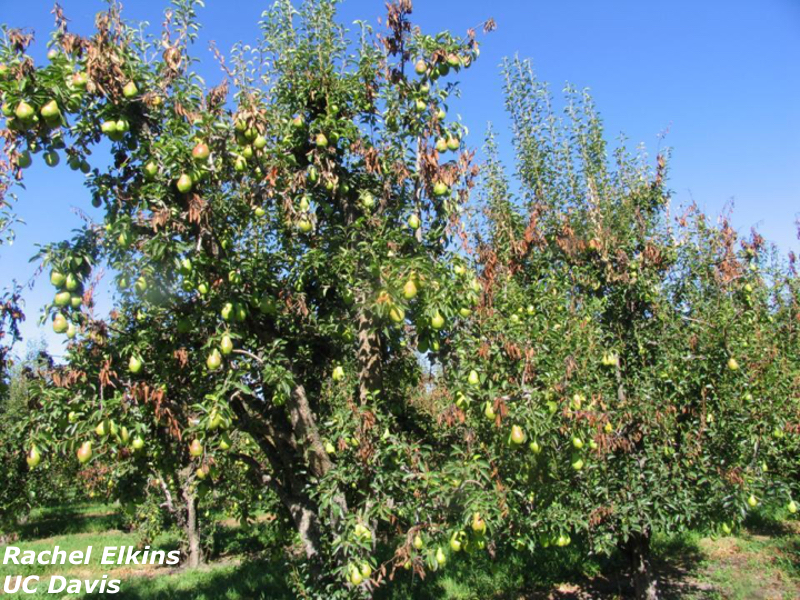 Where disease pressure is high, however, summer-long fungicide applications (once the pear scab season has passed) will be required, particularly in wet summers. Late-maturing varieties may even need fungicide sprays into the early fall to prevent Fabraea from infecting fruit. Fungicide Resistance in the Eastern U.S.
None known because contact fungicides are necessary for control. Other than sanitation, there is no known biological control of Fabraea leaf spot. Flail mowing/chopping leaves and brush and removing obvious cankers on the tree may help to control Fabraea leaf spot and is recommended. 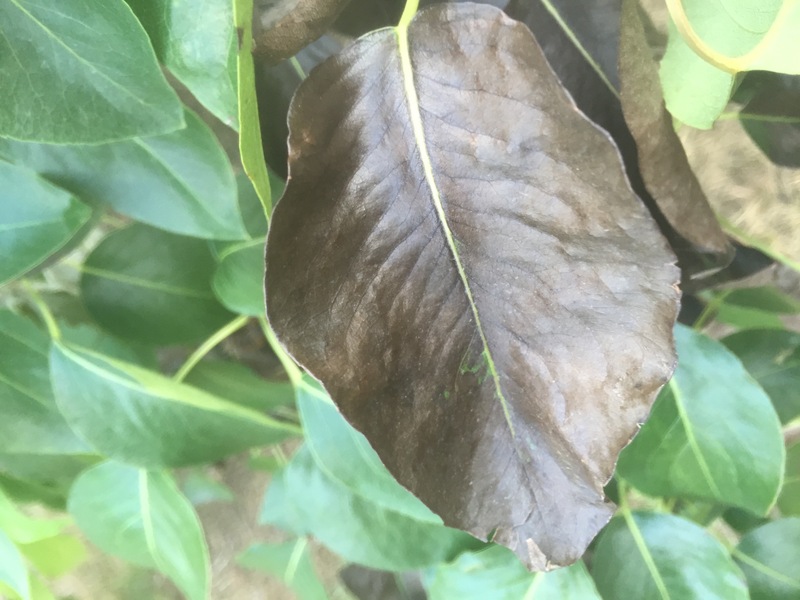 Although there are some variety differences in susceptibility to Fabraea leaf spot, generally just consider the fact all European pear varieties are susceptible such that the disease will need to be controlled. Bosc and Seckel, however, appear to be especially susceptible to Fabraea. Fire bight is caused by the bacterium Erwinia amylovora. Infection by E. amylovora can blight flowers, current year shoots, and even the rootstock. Severe infections may lead to the death of the entire tree. This is especially the case for young plantings in the establishment years. Infection of blossoms begins with bacterial multiplication on the surface of flower stigmas during warm weather. Subsequent rains wash the bacteria into the floral cup where they enter the vascular tissue through the nectaries. Bacteria then migrate through the vascular tissue to the growing shoots and rootstocks causing blight. Sanitation is accomplished by removing blighted shoots and whole trees. Prune blight shoots into last year’s growth. If infection reaches the leader/trunk in small trees (less than 2-3” diam. ), remove the whole tree. Chemical control begins at bloom with biopesticides and antibiotics, which should be applied at forecasted high-risk infection periods. Blossoms: Infected blossom clusters will undergo petal fall normally, but subsequently wilt after 1-2 weeks depending on the temperature. Young infected pedicel may develop an orange cast depending on the cultivar. The young fruitlets will eventually become blackened and necrotic as the infection progresses. Infected blossoms will remain attached and are difficult to remove. In high humidity conditions, bacterial ooze will be produced on the surface of wilted tissues. Similarly, as the infection spreads to shoots, they will wilt and turn black with bacterial migration. The mid vein of leaves on infected shoots may also become blacked and necrotic, and areas of brown to black necrosis may appear across the surface of leaves. 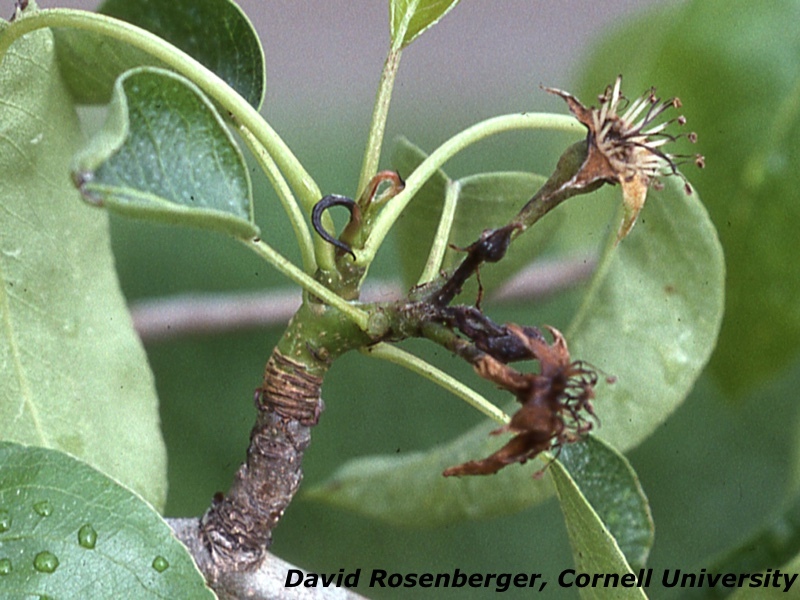 As trees progress into winter blackened cankers may on infected shoots and infected sections of the leader. Depending on when they develop, cankers may or may not lead to a perennial source of overwintering inoculum for later years. If fruit are produced on blighted shoots, these will become arrested in maturation, become black to brown and ooze with bacteria in high humidity conditions. E. amylovora overwinters in cankers which can be large on the trunk and main leaders, or smaller on infected shoots or limbs. 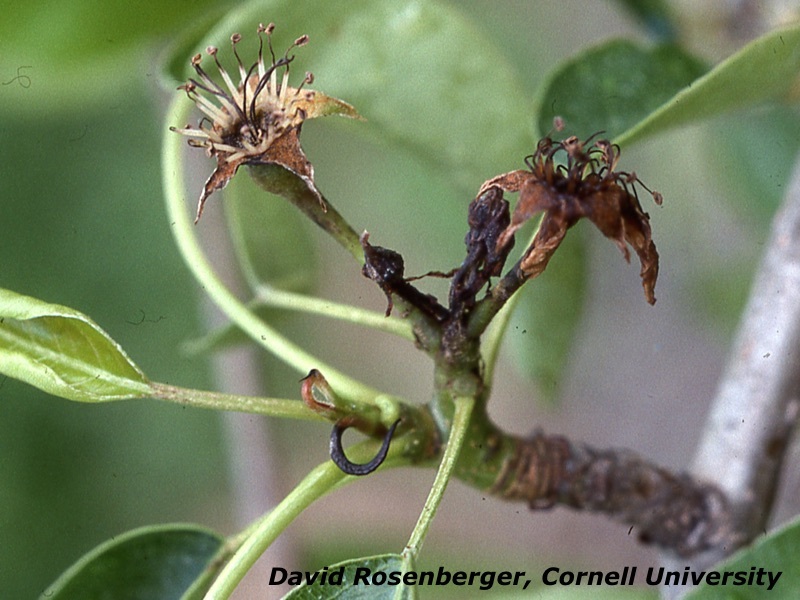 As the weather warms in the spring, cankers ooze and bacteria can be dispersed to blossoms during rains and by pollinator insects at bloom. 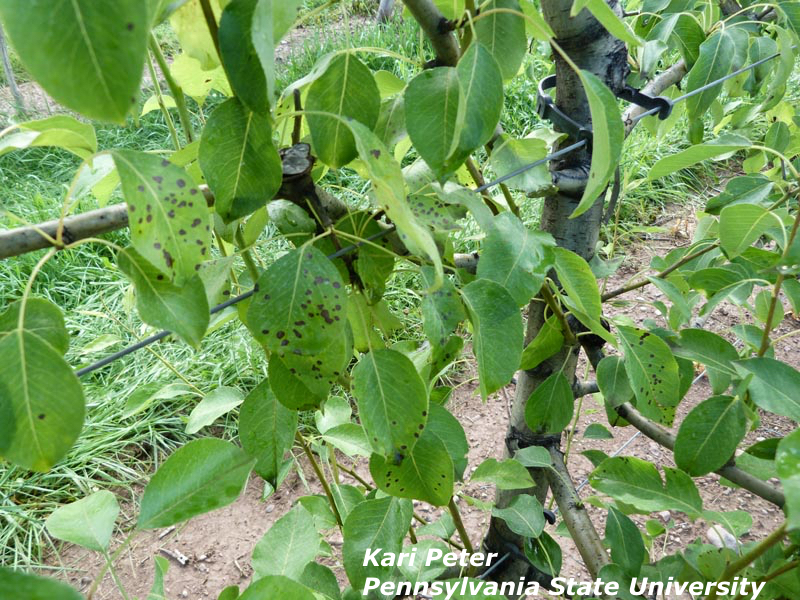 Later in the season, storms, deer feeding, and hail can cause trauma infections from bacteria remaining in the orchard. Root sucker management by mowing or physical removal can lead to additional root infections on susceptible rootstocks. 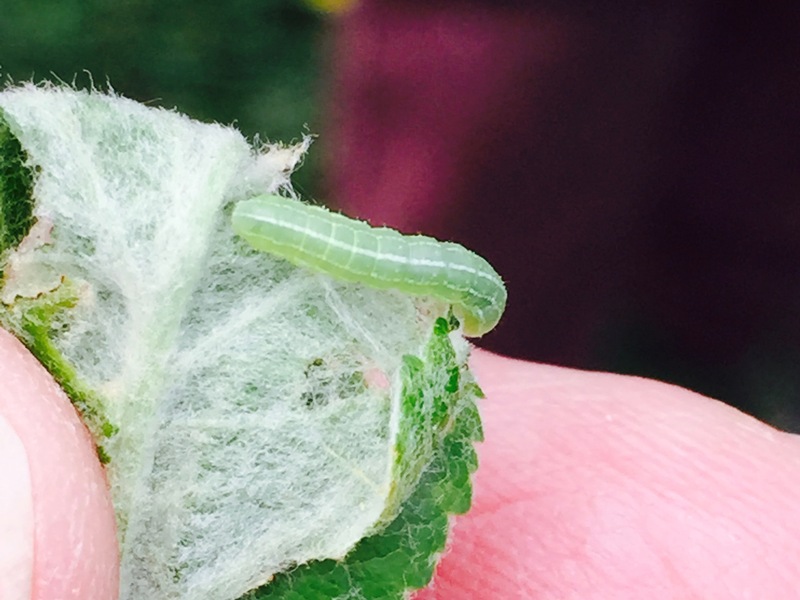 Agricultural antibiotics are most effective means of controlling blossom blight. Of the antibiotics, streptomycin and kasugamycin are the most effective, but only streptomycin has local systemicity. Regardless, oxytetracycline, streptomycin, or kasugamycin should be applied prior to infection events as suggested by disease forecasting tools. Alternatively, applying low rates of copper at weekly intervals is also practiced to protect growing shoots from secondary shoot blight infections. Antibiotic Resistance in the Eastern U.S.
Streptomycin resistance is fairly prevalence in E. amylovora populations in the Western and Midwestern U.S.. Streptomycin resistant was E. amylovora is commonly found in Michigan and was detected in several orchards in western NY. 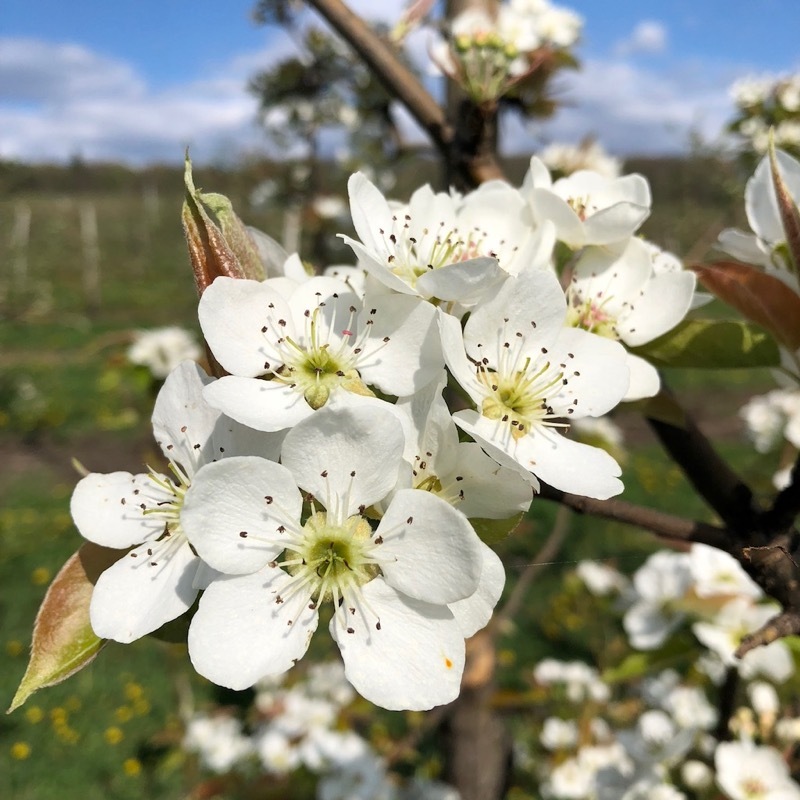 Interestingly, resistant strains in NY have either become quiescent or were subsequently eradicated as they are now difficult to find in NY orchards. Overall, Resistance to antibiotics in the Eastern US is fairly rare and has not been reported for oxytetracycline and kasugamycin at the time of this article. There are a variety of biopesticides and systemic acquired resistance inducers, which can be effective in low-pressure situations with calendar based application schedules. Many of these are acceptable for organic agriculture, but may require considerable numbers of application to be effective. Sanitation is accomplished by removing blighted shoots and whole trees. For best effect, prune blight shoots into last year’s growth or 12” inches below the last visible sign of necrosis. If infection reaches the leader/trunk in small (<2-3” diam.) trees, remove the entire tree. When removing fire blight, take care to choose the coolest and driest days possible. 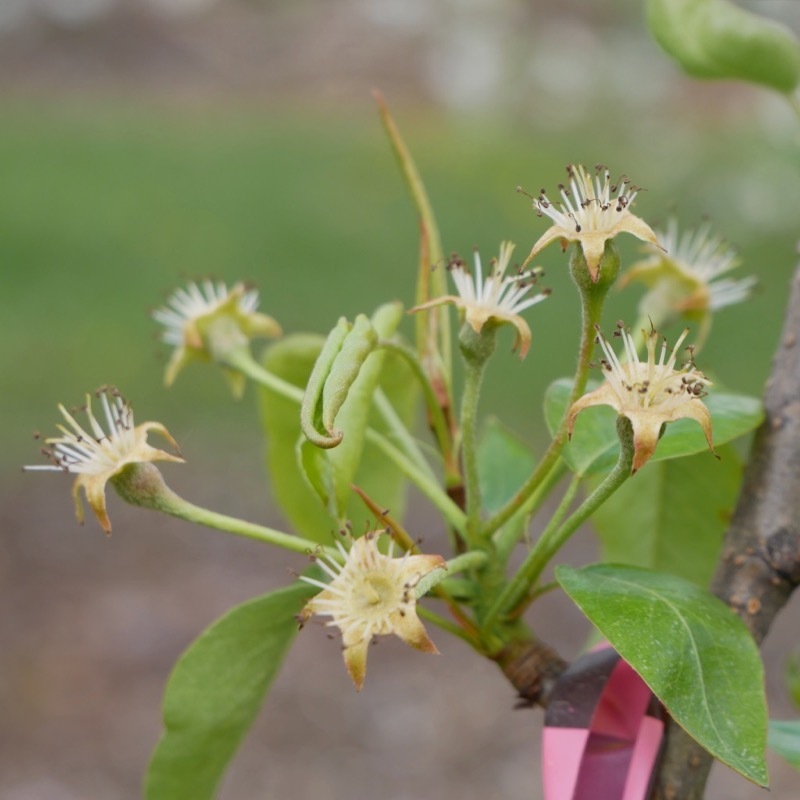 No pear varieties are truly resistant to fire blight, however, some are better than others. European pears that show some degree of resistance include: Harrow Crisp, Harrow Gold, Harrow Delight, Harrow Sweet, Harvest Queen, Kieffer, Magness, Maxine, Moonglow, Old Home, Orient, Seckel, Starking Delicious, and Warren. Among Asian pears showing some degree of resistance are: Chojuro, Kikusui, Kosui ,Seuri, Shinko ,Shinsui, Singo, Tsu Li, and Ya Li. The ‘Harrow’ series of pears out of Ontario, CANADA are quite resistant to fire blight. 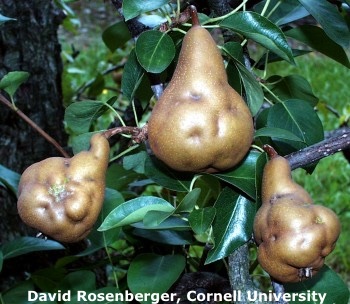 Pear scab is caused by the fungus Venturia pirina. It is similar to apple scab, however, occurs more sporadically. Where present, however, it can cause serious economic loss unless controlled. Infection occurs when overwintering ascospores on leaves and shoots are released during periods of wetting in the spring. 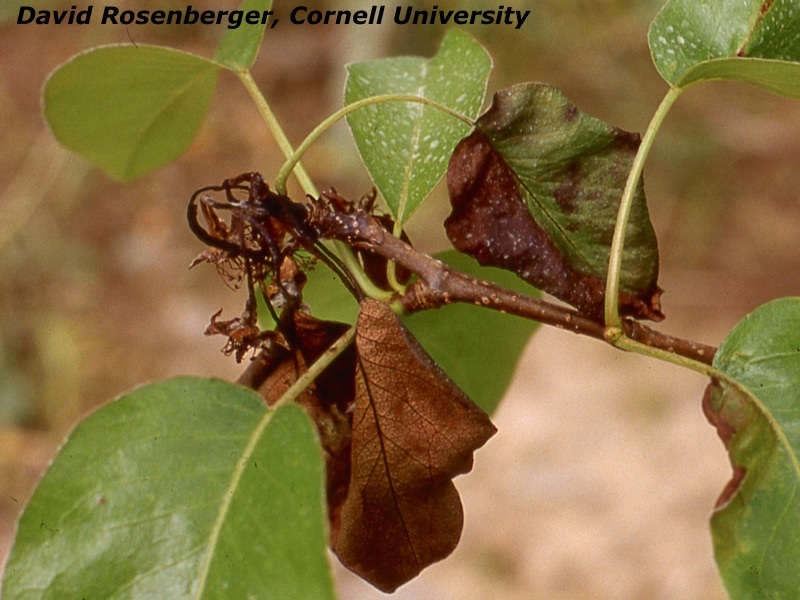 Sanitation by flail mowing leaves and brush may help reduce overwintering inoculum (similar to apple scab), however, chemical control is still typically necessary when pear scab is a persistent problem. 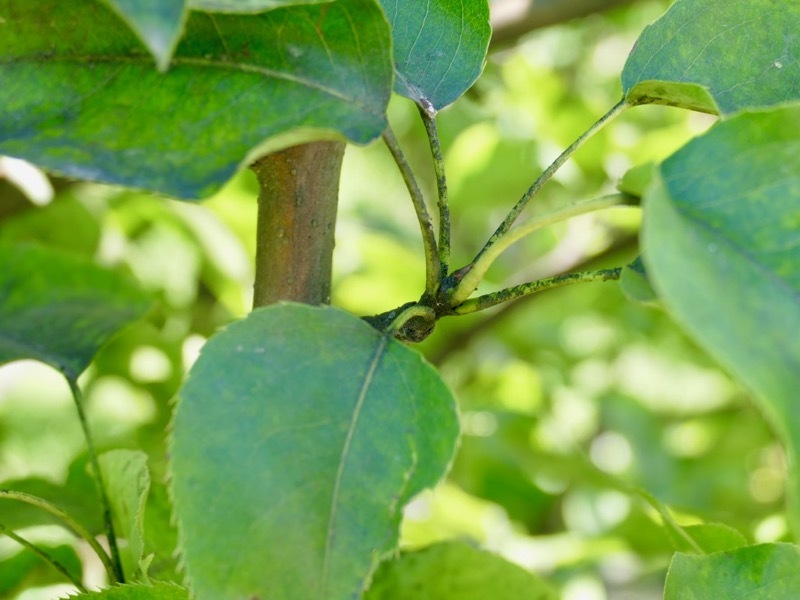 Chemical control using contact and systemic fungicides beginning in the spring and targeting primary infection are recommended to control pear scab. Pear scab symptoms on leaves and fruit are similar to those of apple scab, however, pear scab lesions can also occur on shoots. Scab lesions on leaves are more visible on the bottom of the leaf, but can be kind of small and inconspicuous. Nevertheless, they are olive-colored circular spots. 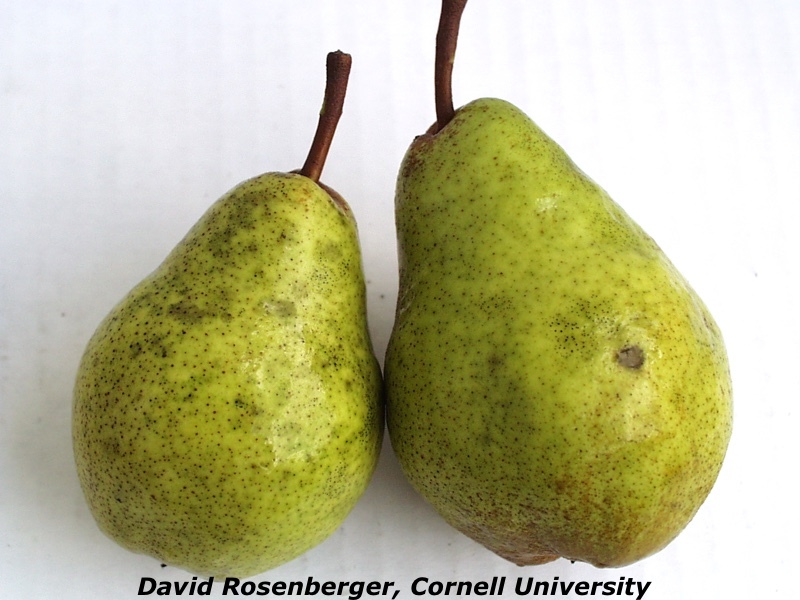 On fruit, pear scab infections are larger and more obvious, again being olive-colored, velvety, circular spots that become more corky and black later in the season. Badly infected fruit results in skin cracking and deformity, and if lesions infect the fruit pedicels, fruit will drop prematurely. If fruit is infected late in the summer, fruit can develop rough, black lesions during storage. 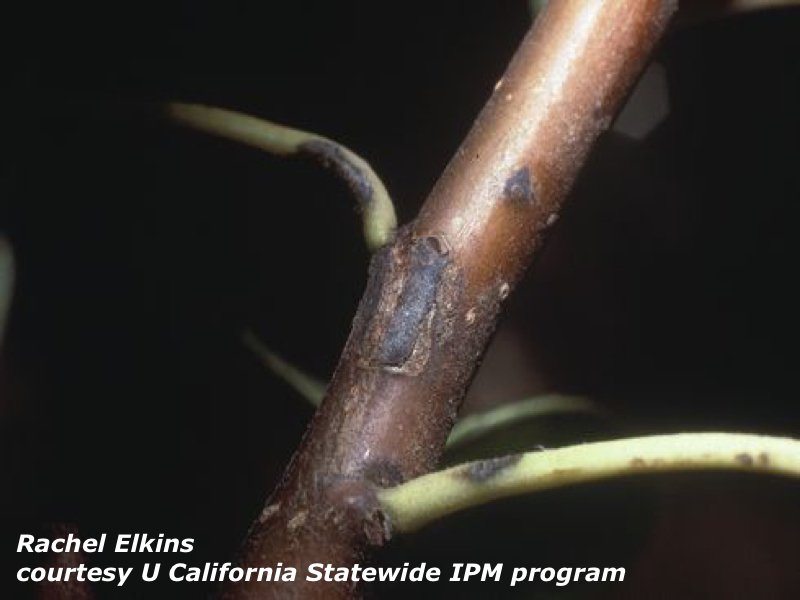 Pear scab lesions on shoots are similar to those on foliage and fruit depending on the age of the shoot and length of time infected, ranging from smaller olive-colored lesions to larger, brown-black lesions which typically are walled-off and slough off the shoots. 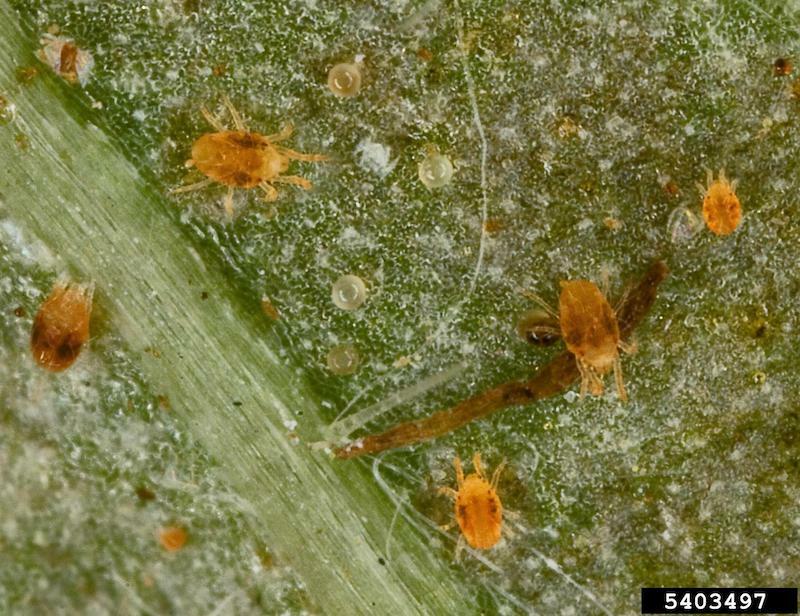 Primary infection results from overwintering ascospores on leaves on the orchard floor and conidia from twig lesions, but the presence of ascospores is usually necessary for significant infection to occur. Spores are mature with bud swell and can be released for up to three months. With some moisture, a degree-day model predicts spores will be mature at about 1,800 degree-days Base 32 degrees F. Periods of wetting with rainfall more than 0.01 inch are required to release spores and initiate infection. 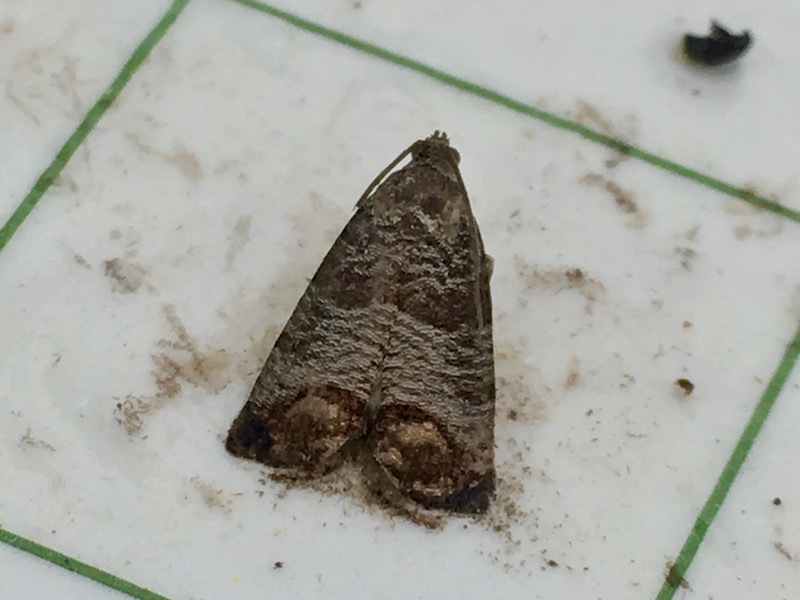 Like apple scab, more spores are released during daytime wetting vs. night. Wetness duration for infection to occur can range from 10 hours to 25 hours at 75 degrees F. and 45 degrees F. respectively. Symptoms appear in 10 to 19 days from infection, and pear fruit become more resistant to infection with age. 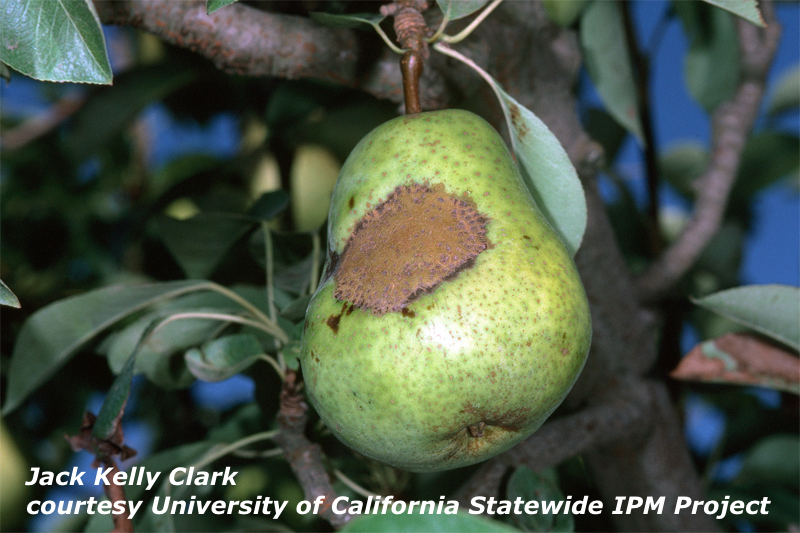 The severity of pear scab infection is highly correlated with amount of inoculum present, just like apple scab. 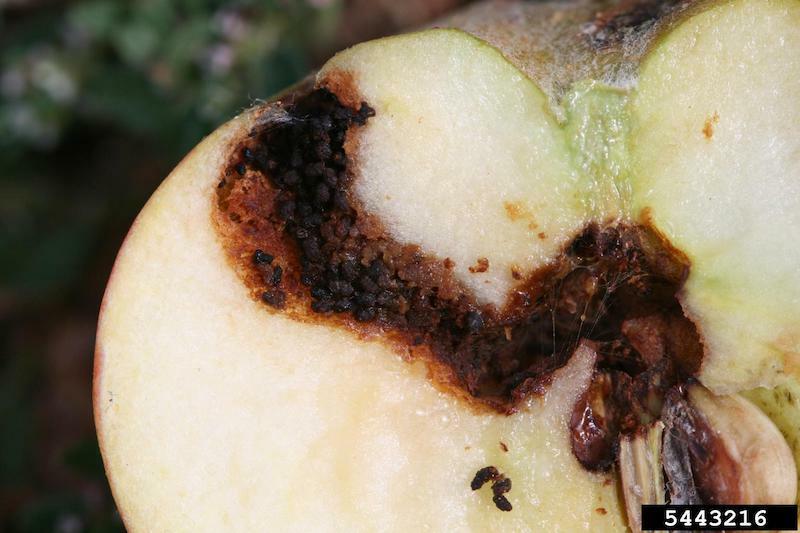 Many of the same fungicides used to control apple scab also control pear scab. Protectant fungicides are the first course of action, and must be applied before wetting periods long enough to initiate infection occur, and beginning when green tissue emerges. They must be repeated at 7-10 day intervals until the supply of inoculum is gone. Systemic “kickback” fungicides may also be used, as long as they are applied in time to provide post-infection suppression of scab. Where protectant fungicides are used, resistance should not be an issue. If, however, systemic fungicides in the same mode-of-action class are used repeatedly, resistance could develop. Thus, fungicide rotation is always advised. 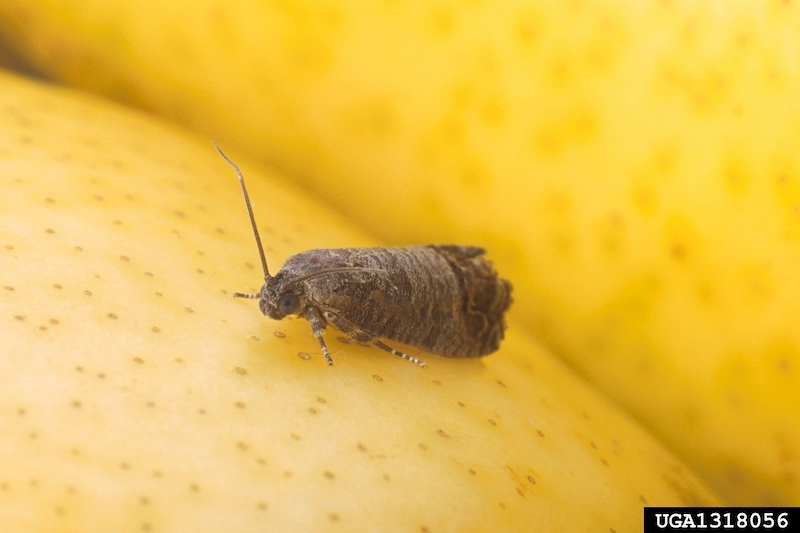 There is no significant biological control of pear scab. Flail mowing/chopping overwintering leaves and/or applying urea to foliage in late fall will help leaves break-down and decrease the amount of inoculum present for infection in the spring. 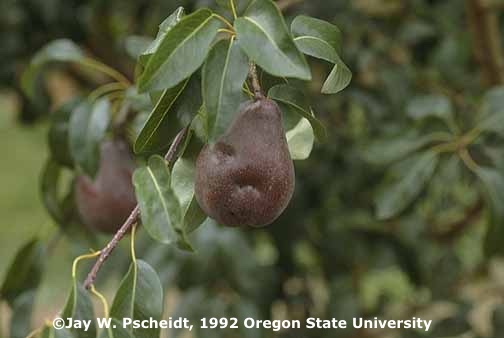 Pear cultivars do vary somewhat in their resistance to pear scab, however, it is not well documented and resistance to one strain of pear scab may not work on another strain. Differences in strains and variety susceptibility means resistance cannot be counted on to provide adequate protection from infection. Sooty blotch and flyspeck (SBFS) is for management purposes one disease that blemishes the surface of apple and pear fruit. Infectious spores of the many fungi that cause SBFS come primarily from wild plants along orchard borders. SBFS activity is most prevalent during the period one to two weeks after petal fall, through to harvest. Cultural controls such as pruning, mowing and removing host plants on orchard borders decrease SBFS risk. Fungicides are the primary control for SBFS. The initial fungicide application each season can be timed using accumulated leaf wetness hours from petal fall. Later fungicide applications should be timed according the amount of rain or the time that’s elapsed since the previous application. Sooty blotch shows as dark, irregularly shaped areas, like charcoal smudges on fruit. Flyspeck develops distinct black, pinhead-sized spots generally clustered in groups of 10 to 50. These symptoms often appear together on fruit, but one or the other may occur alone. Details of the symptoms, such as speck size or blotch margins may vary significantly, as many different fungi can cause SBFS, and disease pressure from weather varies. Symptoms are limited to the waxy apple or pear cuticle, and can generally be removed by rubbing with water or a bleach solution. 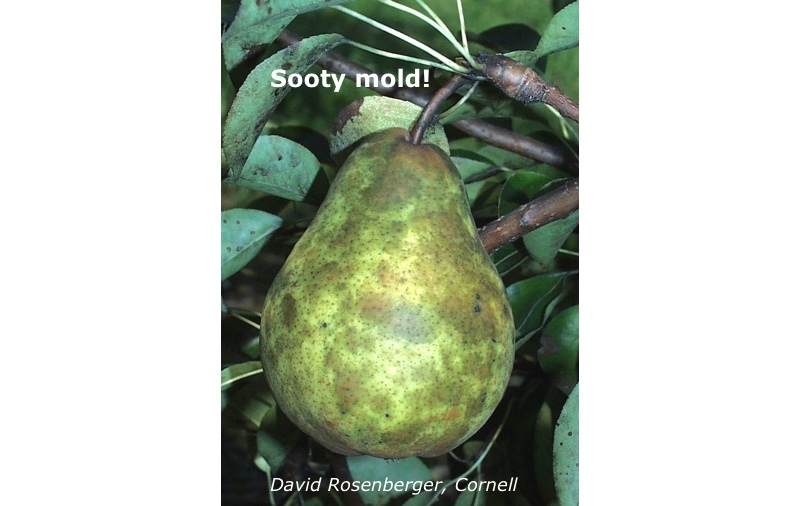 Note that on pear sooty mold appearing as a result of pear psylla infestation can be confused with SBFS (sooty blotch in particular), however, it's usually pretty easy to see the sooty mold on the twigs and foliage in addition to the fruit with sooty mold. (See sooty mold pict in Gallery.) SBFS only affects the fruit. Sooty mold is also generally easily washed off whereas SBFS is not. 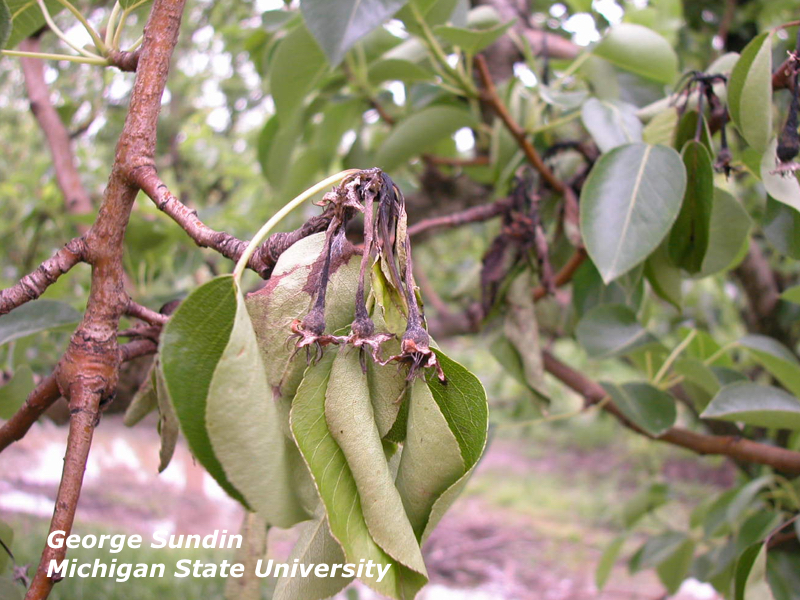 Sooty mold is generally NOT controlled with fungicides (except for maybe Topsin-M), pear psylla needs to be controlled early in the season with timely insecticide application(s). The different life cycles for many fungi that contribute to the SBFS complex are not well understood. Generally the fungi first produce spores that infect apple fruit in mid- to late summer. However, the fungi may infest very young fruit and remain invisible for several weeks, first appearing in late summer or early fall. SBFS apparently has secondary spore production and infection cycles related to rain, with higher rates of disease occurring in years with heavy or frequent rain. These fungi appear to overwinter on plants adjacent to apple & pear orchards. Fungicides applied approximately every two to three weeks, starting with second cover, will generally control SBFS. The most effective fungicides against include the QoI’s (strobilurins: Flint, Sovran, Pristine) and thiophanate-methyl (Topsin, T-Methyl). Captan, Inspire Super and other pre-mixes that contain a QoI (Luna Sensation, Merivon) are not quite as effective but still provide good control. Accumulated leaf wetness hours from fruit set (170 to 220 h) can be used to more accurately time the first SBFS fungicide application. After that, timing should be based on the amount of rain and the time from the previous fungicide application. Fungicides should be re-applied when they are depleted, either by rain or breakdown over time. Use the following depletion rules, applying whichever comes first. Captan (4 lb/A Captan 80 or equivalent rate for other formulations) – 1.5 inches of rain or 14 days. Other Fungicides. Sulfur, liquid lime sulfur and phosphorous acid compounds (for example Prophyte, Phostrol) also suppress SBFS, though less is known about their depletion rates, and with liquid lime sulfur there is risk of russeting on fruit and foliar stress. Post-harvest chlorine bleach. SBFS blemishes may be removed or significantly reduced using postharvest fruit dip treatments in low-concentration chlorine bleach solutions (500 to 800 ppm chlorine) followed by brushing on a commercial grading line. Note: always check label to make sure the fungicide is registered for use on pear. Anything that slows drying in apple and pear tree canopies encourages SBFS development. So larger trees that are poorly pruned develop more disease. Similarly, trees in areas where air circulation is poor develop more disease. The source of many of the SBFS fungi is wild plant hosts in woods or hedgerows adjacent to orchards. Cutting back these border plants, particularly well-known hosts such as wild blackberries, reduces disease pressure. Keep grass in the orchard mowed to reduce humidity in tree canopies. Apple and pear cultivars vary in the amount of SBFS at harvest, but this is primarily related to harvest date rather than resistance pathogen colonization. Later harvested cultivars have the highest SBFS incidence. Lower SBFS incidence on the earlier maturing cultivars apparently results from disease avoidance, as these apples are exposed to fewer hours of wetting and high relative humidity, environmental factors favorable for growth of SBFS fungi. Stony pit is caused by a destructive virus that is transmitted by virus-infected pear wood (rootstocks, buds, or shoots). Symptoms of stony pit are severe dimpling/pitting/discoloration of fruit that can make the fruit unsightly and/or unmarketable. Stony pit can affect all pear varieties (European and Asian), however, it seems to be most prevalent in the variety Bosc. Control of stony pit is only provided by using certified virus-free rootstocks, trees, and budwood. Stony pit first appears as dark green areas on the pear fruits beginning as soon as three weeks after petal fall. Fruit growth is restricted, resulting in dimpling, pitting, gnarling, and deformed fruit. It can be similar and confused with plant bug/stink bug injury, however, stony pit is typically more severe in damage. In fact, the fruit can be severely stunted, gritty, difficult to cut, and measles-like in appearance. Sometimes tree symptoms are observed including pimpling/cracking of bark, stunting of trees, and chlorotic vein-banding or mottling of foliage. (Typical virus symptoms.) Symptoms can appear one year and not the next, although may again show up anytime on the infected pear tree. The virus that causes stony pit is only transmitted by vegetative propagation with infected wood/cuttings/buds. It is apparently not transmitted by insects or seed. Achieved by using only (certified preferably) virus-free wood/buds when grafting, budding, etc. Infected trees should be removed from the orchard, although Bartlett (which is symptomless) could be top-worked onto infected trees. Bosc, Seckel, and Comice seem to be the most severely infected varieties, although all pear varieties (including Asian) are susceptible to having the virus and displaying symptoms. Bartlett appears to be a symptomless carrier of the virus. 5-7 days after petal fall Amid-Thin W (NAD) 10 to 50 ppm 1.6 to 8 oz per 100 gal Label specific for use on Bartlett and Bosc. 14-21 days after full bloom Fruitone-L, PoMaxa, Refine 3.5 WSG 10 ppm 4 to 8 oz per acre Apply as soon as fruit set is apparent and weather favors chemical thinning efficacy. Late applications may result in pygmy fruit. Apply when temperature is 70 to 75 F. Thinning efficacy depends on variety. fruit size 8-14 mm (7-28 days after bloom) Maxcel, RiteWay 75 to 200 ppm 80 to 128 fl oz per 100 gal Start with 150 ppm for Bartlett, 75 ppm for Bosc. Apply when temperature is 60 to 85 F. See comments. 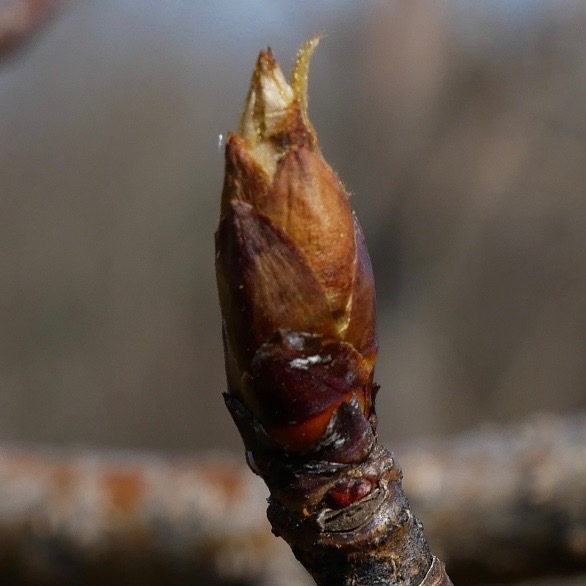 BEFORE buds break in spring on 1-year old wood Maxcel, Promalin; exilis plus, exilis 9.5 SC 5,000 ppm see label If dormant buds are present on one-year-old wood only. DO NOT apply after bud break. See product labels for more details and instructions. 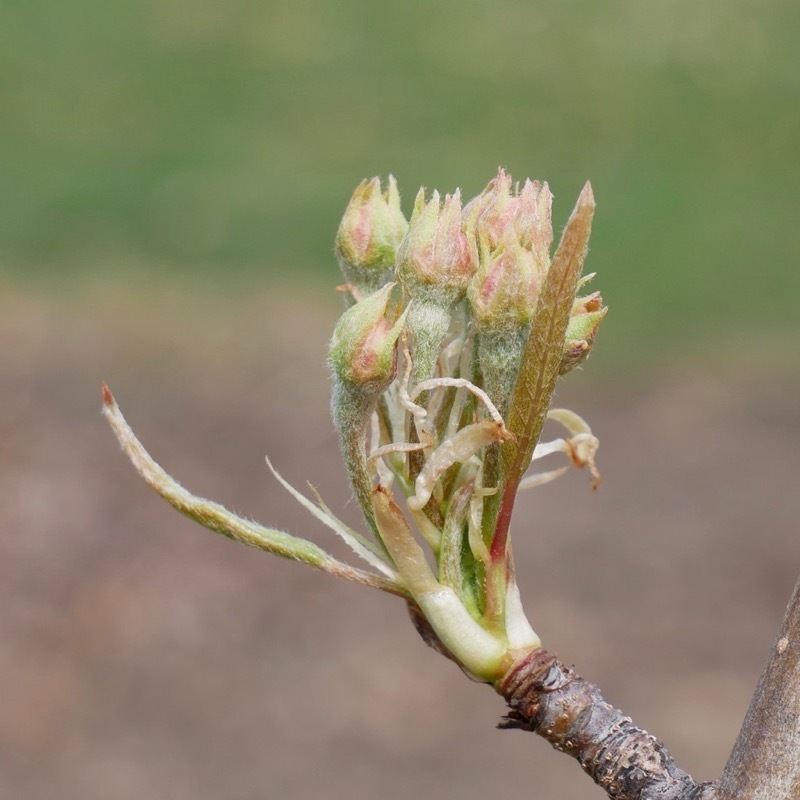 AFTER bud break in spring on 1-year old wood Maxcel, Promalin; exilis plus, exilis 9.5 SC 500 ppm see label If buds have broken, and the leaf tissue is showing on one-year-old wood. Apply by spraying with a back-pack sprayer. Works best when temperatures are warm and there is enough tissue to absorb the PGR. Note: Never add surfactant to a solution of MaxCel as it is already included in the formulated product. Promalin should be combined with a NIS following the label instructions. 7-14 days before anticipated harvest ReTain NA 333 g per acre (one pouch) Apply in sufficient water for good coverage. Add organosilicone surfactant at 12 oz per 100 gallons. 5-7 days before harvest Frutone-L, PoMaxa, Refine 3.5 WSG 10 to 15 ppm 4 to 6 oz per 100 gal Apply 7 days before harvest to D'Anjou, Bosc, Bartlett. Make separate sprays to early, mid, and late varieties. 5-7 days before harvest Refine 24.2L NA 2 to 4 fl oz per acre Bartlett, Bosc only. Effective in 3-4 days after application and controls drop for 2 weeks. 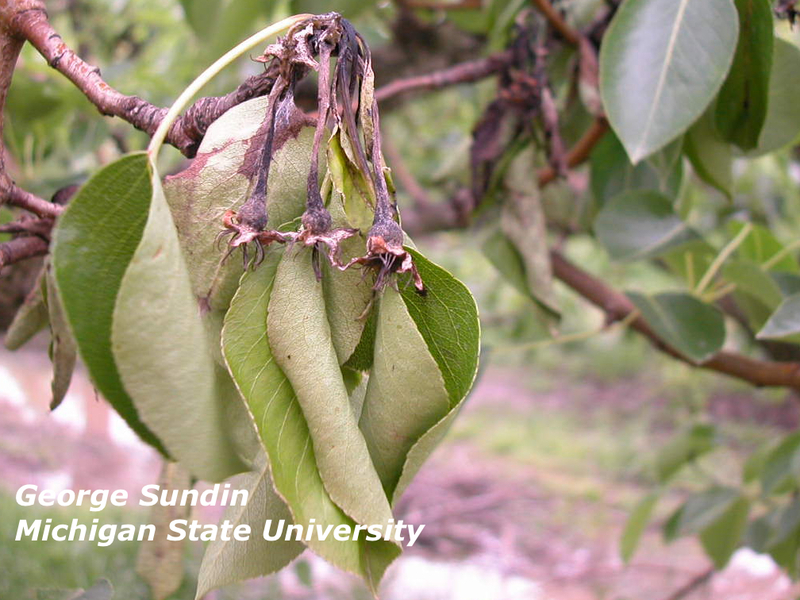 Of high concern at late dormant/delayed dormant is pear psylla. Oil application would be the first IPM strategy, applied as soon as adults are present, usually the first nice warm day in April. If oil application is impractical, use an effective insecticide when adults are present. A high rate copper application for fire blight is also a good IPM strategy at this time. Still of concern at swollen bud is pear psylla. Oil application would be the first IPM strategy, applied as soon as adults are present, usually the first nice warm day in April. If oil application is impractical, use an effective insecticide when adults are present. A high rate copper application for fire blight is also a good IPM strategy at this time. NA Damoil 3 to 6 gal 4 0 don't apply below 32 degrees F.
44 Serifel 4 - 16 oz 4 0 low Begin application at first bloom. Rotate with true antibiotic. Protect the bees! Do not spray Insecticides during bloom! 3A, 6 Gladiator 19 fl oz 12 28 ? 28 Exirel 8.5 to 17 fl oz 12 3 ? 28 Altacor 2.5 to 4.5 oz 4 5 ? Gladiator 19 fl oz 12 28 ? 28 Exirel 8.5-17 fl oz 12 3 ? Promalin® or Maxcel® (Valent USA) and Perlan® or Exilis 9.5SC (Fine Americas), latex paint application FOR INCREASING BRANCHING AND FEATHERING OF NON-BEARING APPLE, PEAR AND CHERRY TREES. Such an application improves tree structure by improving branch angles and increasing bud break and shoot growth in nursery stock and young trees. At the location where branching is desired, apply a uniform application in latex paint mix at a rate of 5,000-7,500 ppm (0.8-1.2 fl. oz./pint of latex paint). The latex paint mix should be applied using a brush or sponge to achieve thorough coverage of the bark surface. 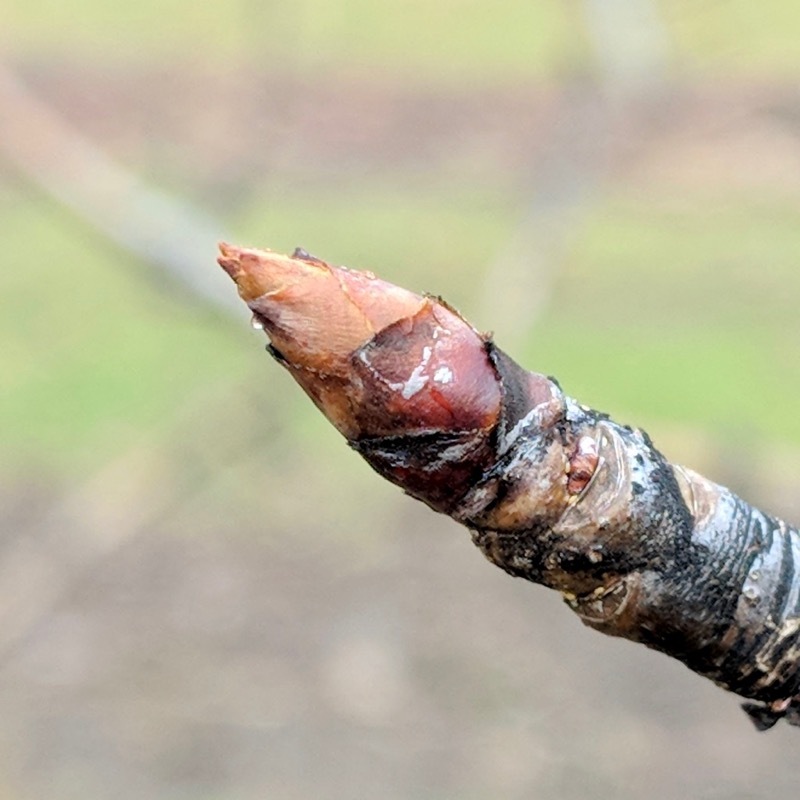 Application should only be made to one year old wood in the spring once terminal buds begin to swell but before shoots emerge. Applications made following shoot emergence may result in injury to the young shoots. DO NOT apply latex paint mix after bud break. Doing so may cause injury to shoot tips and reduce the effectiveness of the application for shoot growth. One-year pre-harvest interval. 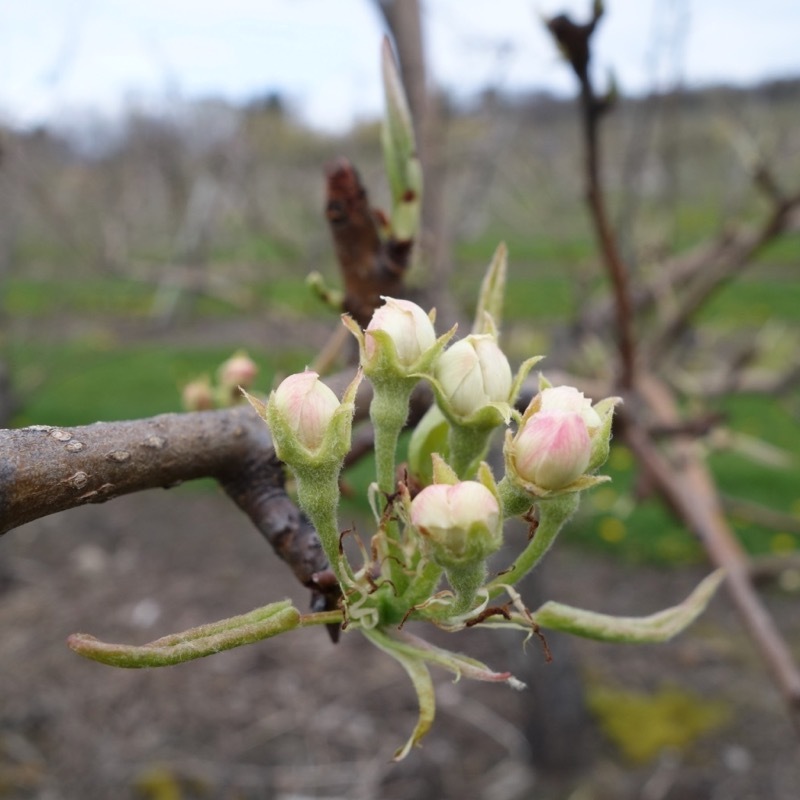 See F-140 Branching Young Apple Trees with Plant Growth Regulators .